Photo: Sunset on Patong beach, Phuket. As Thailand’s tourism cash cow, Phuket regrettably attracts some unsavoury characters looking for quick and dirty access into the wallets of the unwary visitor. Here’s a rundown of some of the most common Phuket scams and rip-offs to be aware of to avoid becoming the island’s next victim. The water’s inviting but the jetski ride could come at a high price. 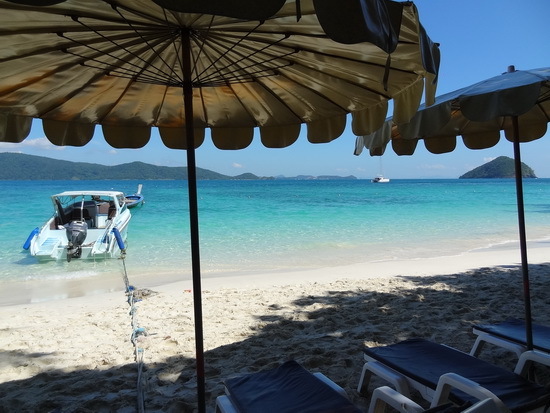 The jetski scam is Phuket’s most notorious tourist swindle. The scam is simple. 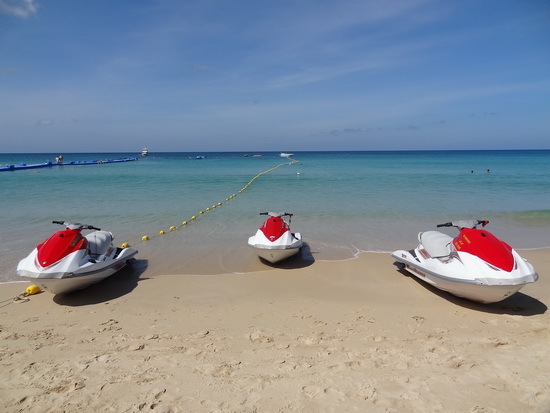 A tourist rents out a jetski for an agreed amount of time and money, then after bringing the jetski back to shore the rental operator points out damage to the vessel and demands a cash payment to cover costs for repairs and lost business. Claims of tens of thousands of baht are not unheard of, and some rental operators will take on a threatening manner if the money is not paid up. This scam gained wider international attention when Patong Beach jetski operator Winai “JJ” Naiman was captured on film in the 2009 British TV documentary Big Trouble in Tourist Thailand threatening a group of British marines when they tried to dispute his claim of costly damage to his rental water scooter. So far efforts by local officials to put a stop to the scam have been futile and, last we heard, JJ and others continue to operate on Patong with impunity. Thus, the only sure-fire way to avoid this scam is to never rent a jet-ski in Phuket. The motorbike rental scam works the same way as the jetski scam. Upon bringing the bike back you’re told that there’s damage to the vehicle that needs to be covered and some outrageous figure is quoted. The big trouble comes for those who have handed over their passport as security for the rental. With no passport your negotiating position is very weak, and it will weaken more and more as your departure date from Phuket looms closer. Never give up your passport when renting a motorbike or car. 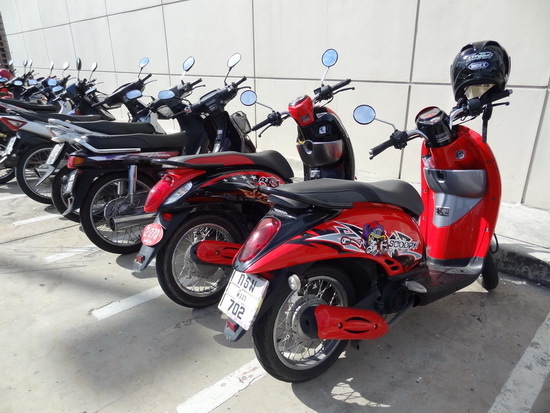 Most of the small rental operators on Phuket will request it but will agree to a cash deposit instead if asked. If a place won’t accept a cash deposit to secure the rental, don’t rent the vehicle there. Phuket has plenty of shops to choose from. A great way to get around, but not worth having your passport held to ransom. Before you drive off, be sure to inspect the bike together with the rental operator and note any damages. For car rental, there are certainly some honest local rental companies but renting from a known international brand such as Budget or Avis with clear rental contracts might offer some added peace of mind. 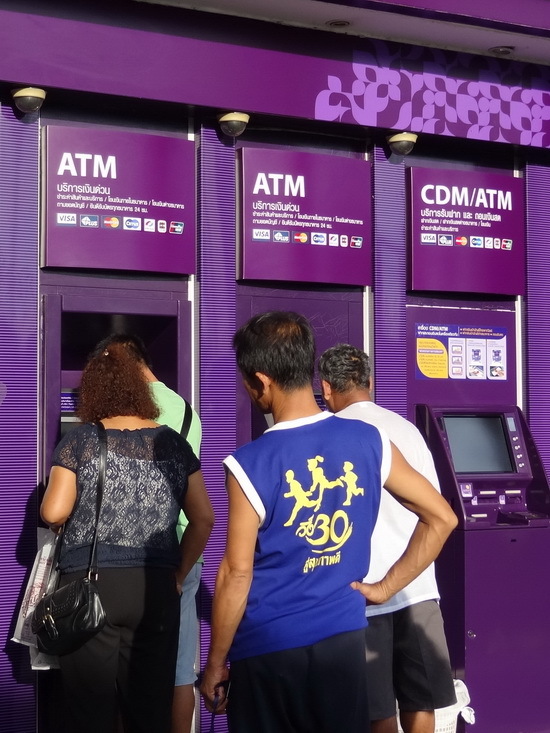 ATM and credit card skimming is something else to watch out for in Phuket. One way scammers gain access to your card’s information is to attach a device to an ATM’s number keyboard or card slot. The device copies your PIN code and other information that will be used later to make a fake card. These devices are not easy to detect, but if you notice something strange on an ATM machine, choose another one and report what you’ve seen to the bank if possible. Another scam is for cashiers to make one or more extra swipes of your card when processing your payment. We know of one Phuket resident who was stunned to discover a 10,000-baht charge on his credit card bill a month after handing his card over for payment at well-known department store for a small purchase of clothing. He’d unwisely given his card to the shop lady and let her swipe it out of sight. To avoid this fraud, be sure to stand by and keep a close watch as your credit card purchase is being processed. The Australian Government’s Scamwatch website has more details on how to avoid a card skimming scam. ATM cards are convenient, but costly if skimmed. Timeshare scratch cards are more a deception than a scam. For most victims it results only in some lost time during their holiday rather than any monetary loss. The most common set-up is when a sales rep – usually a young European – approaches someone on the street to offer a scratch card that gives a chance to win a free boat trip or some other enticing service. Or a tourist sitting on a beach will be asked to fill out a tourism survey and be promised a prize in return. In either case it’s a ruse for getting your name and hotel contact information. Soon afterwards, the “lucky” tourists will receive a call and be told that they’ve won the prize and are invited for a day out. But before or after enjoying their promised trip or prize, they’re shuttled into a room somewhere and forced to listen to a hard-sell presentation about a timeshare, or fractional ownership, property opportunity. As far as we know, there are no reports in Phuket about people shelling over money for timeshare deposits and getting nothing in return – the timeshare properties are real. But the way some of these are sold can be misleading, even intimidating, and for most this is an annoying and unwanted diversion from their holiday time. Scratchcard paradise. Winning an island excursion might come with an unwanted side trip. If you arrive in Phuket without knowing where you’ll stay you’re in for a bit of hustling from accommodation touts. The Phuket International Airport arrivals area and many of the ferry boats coming from Ko Phi Phi are teeming with agents trying to strong-arm you into a spot where they’ll be sure to pocket a commission. Sometimes this can be helpful if you’re patient and firm in your insistence that you won’t book any place until you’ve first had a look. Oftentimes, however, you’ll end up being taken to hotels that offer less than promised. Even if you have booked a room in advance you may find yourself at the mercy of a taxi driver claiming to not know where to find it or stopping at an agency where you’ll be pressed to change your booking into one of its recommended places instead. Again, be firm and insistent. Though it might not feel as adventurous, booking a room in advance and arranging for pick-up at the airport might be the best way to ensure a more pleasant arrival to Phuket, at least for the first night or two till you gain your wits. Soi Bangla, the crowded walking street and nightlife hub of Patong Beach, is rife with hustlers of all sorts including those who lure you in to the ladyboy photo scam. When strolling along, you might be approached by some glamorously dressed ladyboys, or katoey, and invited to take their photo. What you’re usually not told till after you’ve taken the photo is that they are charging 100 baht or more for the privilege and you need to pay up now. If you don’t pay then expect to receive some nasty comments or worse: attacks on tourists have been reported. The small fee is not worth having your head bashed in over, so if this happens to you it’s best to just hand over the cash and carry on. It’s amazing that people continue to fall for the Phuket black money scam, but every so often there’s a report in the news of yet another arrest or complaint. Black money scammers convince their victims that they have a large stockpile of currency, usually US dollars, that has been taken out of circulation and marked with black dye. But with the purchase of some special, expensive chemicals, the money can be “washed” and made viable again. Of course, the chemicals are useless and the victim’s left with a pile of worthless paper after handing over sums of 20,000 baht or more. The lesson: keep your greed in check and don’t fall for any scheme that sounds too good to be true. If you do find yourself a victim of a scam or other crime in Phuket, contact the nearest police station to report the incident, and you might be able to find additional assistance from your home country’s embassy in Bangkok. Some countries have honorary consuls in Phuket who can be called on for help, too. Phuket also has an active Tourist Police force with foreign volunteers that speak English and other languages. Of all the scams to watch for in Phuket, the taxi rip-off deserves special mention. Anyone who has travelled through any other part of Thailand will be shocked the first time they hire a Phuket taxi or tuk tuk, which can be four or five times more expensive than trips of a similar distance in Bangkok or elsewhere. The Phuket tuk tuk: a modest ride at an opulent price. Though this is one of the biggest complaints by tourists to Phuket, it seems unlikely to change any time soon. The taxi and tuk tuk “collectives” have long had an iron grip on the island’s transport services. Greed and territorial attitudes have stymied all attempts to create an affordable, island-wide public transport service. Phuket’s various groups of drivers operate like little fiefdoms and anyone trying to do business on their patch will be run out of town. Thus, tourists needing a ride from one beach to another are charged an amount that covers the cost of not only for their trip there, but also the return trip of the empty taxi since the driver will be barred from picking anyone up at their destination. The choices for taxi service are the tuk tuks, which in Phuket are four-wheeled open-air Daihatsu vans, official green-plate taxis and unofficial black taxis. The latter could be anyone from a private service operating from a guesthouse to Mr Somchai down the road who sees that you need a lift and has a bit of time to spare. Regardless, there’s little difference in price no matter which option you choose. 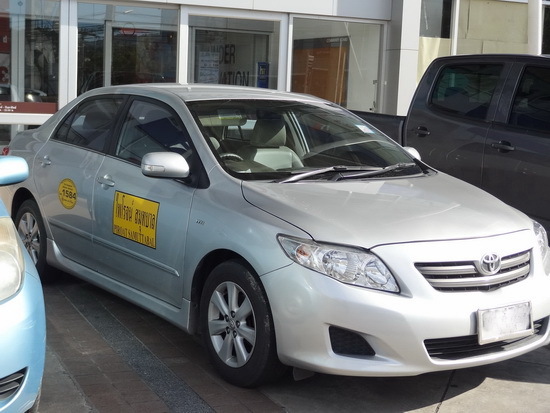 There are metered taxis, too, which are slightly cheaper, but good luck finding one beyond their stand just outside the Phuket airport arrivals hall. Getting just a bit legit: a Phuket ‘black’ taxi. Some current fare examples: To get from one west-coast beach to another expect to pay minimum 400-500 baht, while taking a taxi or tuk tuk from one side of Patong Beach to the other will be 100 baht at least. A ride from the Tesco-Lotus superstore to Central Festival Phuket shopping mall, a trip of less than two kilometres down the bypass road, costs 200 baht. If taking a tuk tuk or taxi, it’s essential to negotiate a fare in advance to avoid having a nasty surprise at the end of your journey. Check, too, if the fare quoted is for the ride or per passenger. If you do end up getting ripped off, try to keep your cool. Fare disputes have turned violent on a few occasions in Phuket. 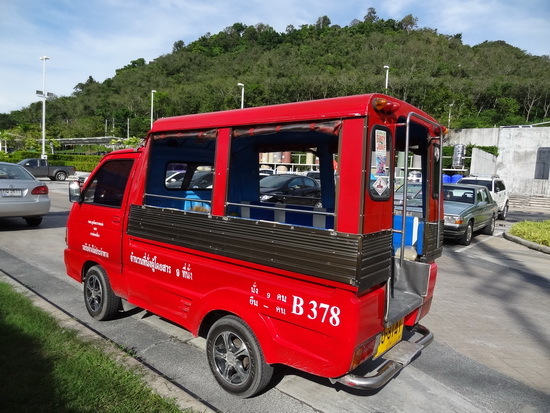 Another thing to watch for: Phuket visitors needing a lift might alternatively be offered an incredibly low fare for their tuk tuk trip, something like 10 or 20 baht, or even a free ride. But then on the way to their destination they’ll inevitably be told about some great shops that the driver needs to stop at first. They might end up spending hours being taken to a number of gem and souvenir shops where the driver will collect a commission at each stop along the way. Unless you’re really strapped for cash — or you are actually interested in the shopping — the cost savings for a commission-fuelled tuk tuk trip probably aren’t worth the time and hassle. There’s a small glimmer of hope in the Phuket taxi situation with an effort underway to register all the black taxis. Several cars now rove the island with a big sticker on the side displaying the driver’s name in English and Thai and a 24-hour helpline number 1584 (but dialling the number leads to a recorded message in Thai, so non-Thai speakers will need assistance). Though this move does nothing to address the high prices, it’s a baby step towards accountability for Phuket taxi drivers, and hopefully the start of more changes. How long should you spend on Phuket? Phuket weather: When is the best time to go?